Renewable energy continues to surge in the European Union (EU). The latest achievement is 100 GW of wind power, the equivalent of 62 coal power plants. 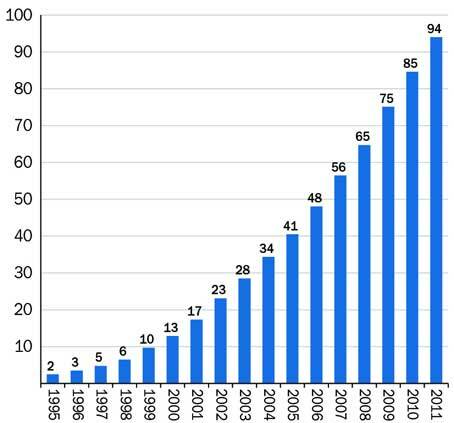 The growth has been fast, “it took twenty years to get the first 10 GW grid connected…only 13 years to add 90 GW.” And half of that was added in the last six years. To produce the same amount of electricity with coal – in one year – would require the mining, transport and burning of 72 million tons of coal, at a cost of $6.48 billion. For a broader perspective, the United States is also booming having recently achieved 50 GW of installed wind power. But the most important number is the total electricity used in the EU – 3.6 million GW. And this wind milestone only represents 0.003% of that. Like an ant standing at the foot of the mountain.